Three members of the Wilmington Mormon crew, Echo Townsend, Elise Strevel, a fourth member of the Wilmington crew, Suzy Boehm, Karen Edwards, William Calhoun, Jill Marie, Patrick McGinity, and Michael Todd Ferrell, Rocky Point, North Carolina, US, October 2018. Photo by Kadampa Center. Not pictured, Barry Judge. Interfaith activities are one of FPMT’s Five Pillars of Service. Following September’s Hurricane Florence, FPMT center Kadampa Center in Raleigh, North Carolina, US, joined in on relief efforts. The center ran a three-week people and pet food drive, collecting 921 pounds (418 kilograms) of non-perishable food. 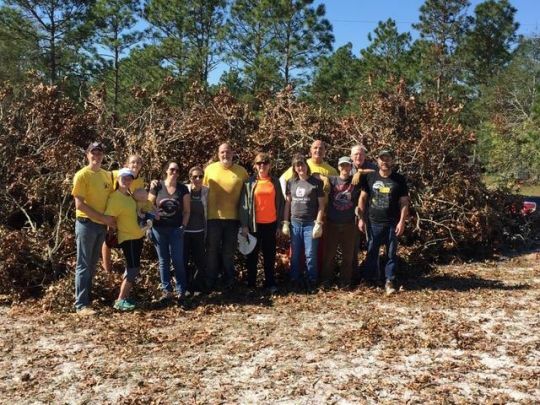 Then on October 13, 2018, the Hurricane Florence “Kadampa Klean-up Krew” united with members of the Mormon community to provide hands-on help to hurricane victims in the Wilmington, North Carolina, area, which was where the hurricane made landfall. Elise Strevel, outreach coordinator, shares the story. William Calhoun working the chainsaw while a member of the Wilmington Mormon team and Patrick McGinty hold the ladder, Rocky Point, North Carolina, US, October 2013. Photo by Kadampa Center. There are many Mormon churches in the state of North Carolina and every one of them have a strong service component. 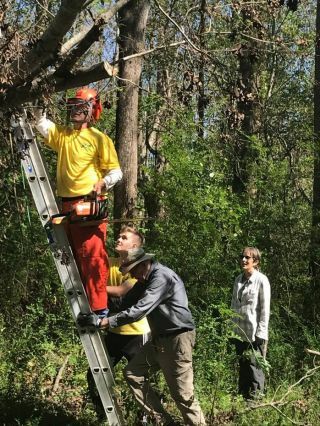 The Mormon groups out of Wilmington have highly organized crews working daily to provide disaster relief in response to Hurricane Florence, and others join their teams or create new teams as appropriate. William Calhoun is a member of the Raleigh/Cary Mormon Church and was the liaison who hooked us all up with a team working out of Wilmington for the day. I know William through the Kadampa Center’s affiliation with the Triangle Interfaith Alliance (TIA). We are both TIA board members. Eight members of Kadampa Center participated in the October 13 cleanup efforts in Rocky Point, which is just outside of Wilmington. 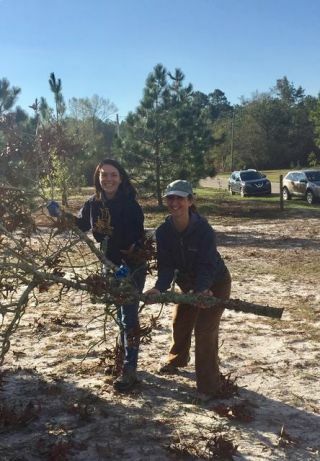 Echo Townsend and Jill Marie clearing away a large branch, Rocky Point, North Carolina, US, October 2018. Photo by Kadampa Center. We all had a wonderful and very productive day for so many reasons. We had the opportunity to translate compassion into action by helping people whose lives have been devastated by the storm; to serve with enthusiastic, hard working, and kind members of the Mormon Church; and to work with our Buddhist friends from Kadampa Center, getting to know them more deeply and appreciate them more than ever! An additional little treat was an appearance by Mrs. North Carolina, Mrs. Utah, and Mrs. USA! They stopped by to briefly participate in the work and to encourage everyone. We all worked so well and so hard together that in about five hours we got over eight large trees on two properties cut down, dragged all of the branches to the roadside for pickup, and stacked all the logs. Most of the Mormon team worked the chainsaws, and the Buddhist team disposed of the branches and logs. Mrs. North Carolina, Nichelle Sublet; Elise Strevel; and Mrs. USA, Nicole Cook, Rocky Point, North Carolina, US, October 2018. Photo by Kadampa Center. In addition to our collective service work, the Mormon community sent more than twenty truckloads of food, personal hygiene, cleaning supplies and equipment such as shovels, plastic gloves, roofing materials, and tarps to Wilmington and Fayetteville. To the best of my knowledge, the Mormon community has a very strong service mentality, and strongly believe in generous tithing. This allows them to finance truckloads of emergency supplies to be at the ready for any such natural disasters. They set up a command post in Wilmington so teams could relay supplies to areas around the region as needed. They are most certainly a role model for compassion in action! It was a wonderful learning experience about how the activity of another faith expresses this quality. Very impressive, very humbling.